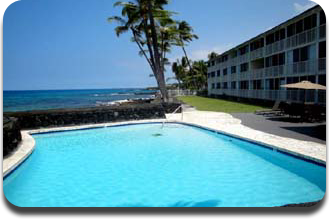 Steps away from Kona Magic Sands Beach. Total Ocean View. This comfortable , absolute ocean - front 3rd Floor unit is perfect for your special romantic occasions; however it will sleep four.This is a studio unit. Privacy,security & sunset views are all yours for your vacation on the Big Island of Hawaii. The unit has a fully equipped view oriented kitchen, living room with new furniture ,new queen size bed, and a lanai with sliding glass doors that open to the ocean - where Whales, Dolphins, Green Turtles and a myriad of colourful fish can be seen most days. We have done a complete renovation on 309. It has been completely re painted. We have added a new dresser with and HD TV with Wii Fii. A new Queen size bed with a new mattress and bedding. All new dishes. All new face cloths,hand and bath towels. New coffee table pictures and mirrors. We have also added for your beach fun. Two boogie boards,two sets of snorkel gear and beach towels. 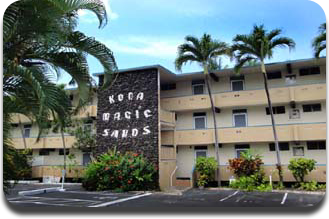 Common areas of Kona Magic Sands Condos are well maintained and has clean redone pool, BBQ (propane) ,individual parking space, laundry room has 2 washers and 2 dryers. Keauhou Shopping Center is miles south on Alii Drive. There is a Kita Grocery Store, Pizza Parlour, Longs Drugstore, and Movie Theatre. A cozy little retreat. Every day I visited the beach down-stairs where we swam with the turtles visiting there. The room was clean and comfortable. The hosts were very gracious. Great stay overall. Wow! Best Deal in Kona!!! I can't wait to return. Unit 309 is clean and simple. It had everything and more! The drive down Alii Rd. to Kona Magic Sands was fully amazing, as was Kona Magic Sands Beach which is steps away. The Big Island is full of awesome sights as you will experience if you ever visit. I recommend reserving a car rental as soon as you book your vacation as the rates will be lower the sooner you book. Then you are free to travel at your convenience to all sights. And there is a Trolley that goes into town daily if you want to go out on the town. I would totally take advantage of the snorkeling gear and boogie boards that are provided in the unit. The snorkeling was the most fascinating snorkeling I have ever seen. It felt like we were in a fishbowl and was most relaxing (even when swimming an arms length away from sea turtles).